On March 6, 2019, a 35-year-old contractor with 35 weeks of experience was fatally injured when he was struck by a relief valve that was ejected from a 500-ton hydraulic jack. The hydraulic jack was being engaged to make contact with the frame of a P&H 4100A shovel when the relief valve was ejected. Inspect, examine, maintain, and evaluate all materials and system components used in the installation, replacement, or repair of pressurized systems to ensure they are suitable for use and meet minimum manufacturer’s specifications. 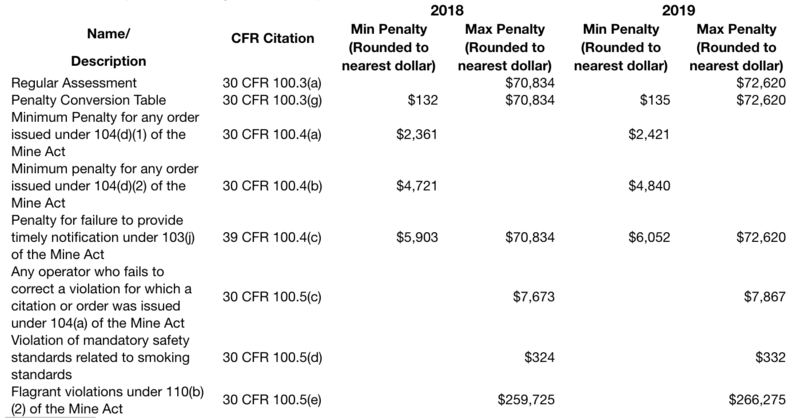 The table below reports the change to MSHA’s penalties in 2019. 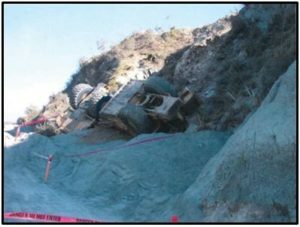 On Monday, January 14, 2019, a 56-year-old survey crew member with approximately 30 years of mining experience was fatally injured after he was struck by a loaded shuttle car. The victim was measuring the mining height in an entry that was part of the travel-way used by the shuttle car to access the section feeder. Before performing work in an active haulage travel-way, communicate your position and intended movements to mobile equipment operators and park mobile equipment until work has been completed. On Saturday, January 5, 2019, a 55-year-old contract miner received fatal injuries when he was pinned between a pneumatically powered air lock equipment door and the concrete rib barrier located near the shaft bottom. Design and maintain ventilation controls, including airlock doors to provide air separation and permit travel between or within air courses or entries. Ensure that airlock doors are designed and maintained to prevent simultaneous opening of both sets of doors. Ensure miners are trained in the proper use of automatic doors and procedures to follow in the event the doors malfunction. Provide means to override automatic airlock doors and allow manual operation in case of an emergency. Keep the path of automatic doors clear of miners and equipment. When changes in ventilation are made, test automatic doors to ensure they operate safely under the new conditions. Perform thorough examinations of airlock doors to assure safe operating conditions. When a hazardous condition is found, remove the doors from service until they are repaired. 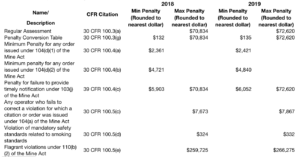 The U.S. Department of Labor’s Mine Safety and Health Administration (MSHA) reports that 27 mining fatalities occurred in 2018 – the second lowest number ever recorded. Eighteen fatalities occurred at surface operations; nine occurred in underground mines. Approximately 250,000 miners work across 12,000 U.S. metal/nonmetal mines, and 83,000 miners work in the nation’s 1,200 coal mines. The leading cause of fatalities was powered haulage, which accounted for 13 fatalities or 48 percent of the annual total. MSHA has taken action to counter powered haulage fatalities, including publishing a Request for Information seeking stakeholder input on technologies and practices that can improve safety conditions related to mobile equipment and belt conveyors. MSHA also launched a campaign to educate miners and mine operators on the hazards associated with such equipment.